Robert Bowers, arrested in synagogue massacre, argued there is a war between Jews and Western civilization, claimed Jews control Trump. 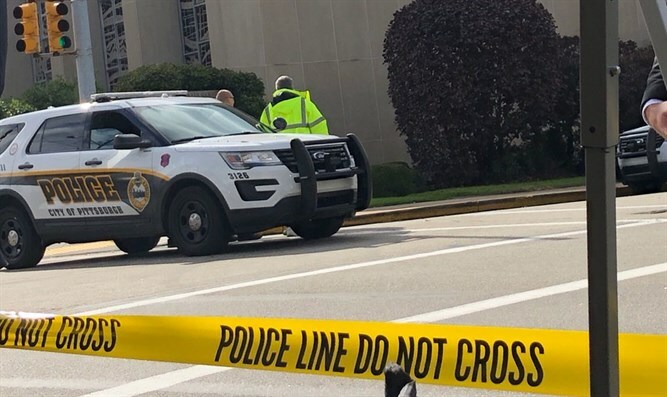 A day after the deadly mass-shooting in a Pittsburgh, Pennsylvania synagogue, investigators continued to probe gunman Robert Bowers, the 46-year-old resident of Baldwin, Pennsylvania responsible for the attack. On Sunday, Scott Brady, US Attorney for the Western District of Pennsylvania, confirmed claims made shortly after news of the attack broke that Bowers had explicitly expressed a desire to kill Jews before and during the 20-minute shooting attack on the Tree of Life synagogue. According to the federal complaint against Bowers which was publicized Sunday, Bowers told the arresting officer at the scene of the mass-shooting Saturday that Jews were “committing genocide” against whites, and that he felt motivated to target Jews. Attorney General Jeff Sessions said earlier that the Justice Department was treating the case as a hate-crime. Thirteen people were shot Saturday morning after Bowers burst into the Tree of Life synagogue during a circumcision ceremony and opened fire with an AR-15 semi-automatic rifle and several handguns. During the 20-minute melee, eleven people inside the synagogue were fatally wounded, with two others were wounded. After police arrived on the scene, Bowers shot and wounded four officers, before he was shot and wounded by police, and surrendered to authorities. Bowers’ social media accounts were littered with anti-Semitic rhetoric, conspiracy theories, and attacks on the US government and President Donald Trump. On his account on the ‘Gab’ social media outlet, Bowers - who according to Pennsylvania state voting records was a registered independent - claimed that a Jewish conspiracy controlled the US government and was dedicated to ‘controlling whites’. 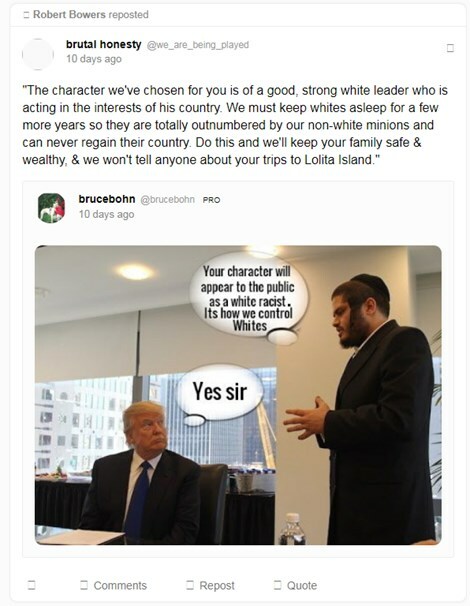 In an image Bowers reposted to his account, President Trump is shown taking orders from an Orthodox Jewish man. In another post, Bowers mocked President Trump as a “globalist” and apparently endorsed the ethnic cleansing of Jews from America. Drawing on ideas popular within white nationalist and neo-Nazi movements, Bowers blamed ‘Jewish propaganda’ for the ‘certain extinction’ of Western civilization and the white race. “Jews are waging a propaganda war against Western civilization and it is so effective that we are headed towards certain extinction within the next 200 years and we're not even aware of it,” Bowers reposted on his Gab account. Bowers also wrote that Jews were “the enemy of white people” and called for the mass-deportation of Jews from the US. Shortly before the attack, Bowers wrote on Gab blasted the Hebrew Immigrant Aid Society (HIAS) for its services for refugees inside the US, saying that "HIAS likes to bring in invaders that kill our people. I can't sit by and watch my people get slaughtered. Screw your optics, I'm going in." In other posts, Bowers explicitly linked his hatred of Jews to anxiety over immigration.